Four young musicians full of euphoria raring to go are in the starting gates, eager to be finally able to show what they can do. In this respect, the title "Cast off – Leinen los" (trans. 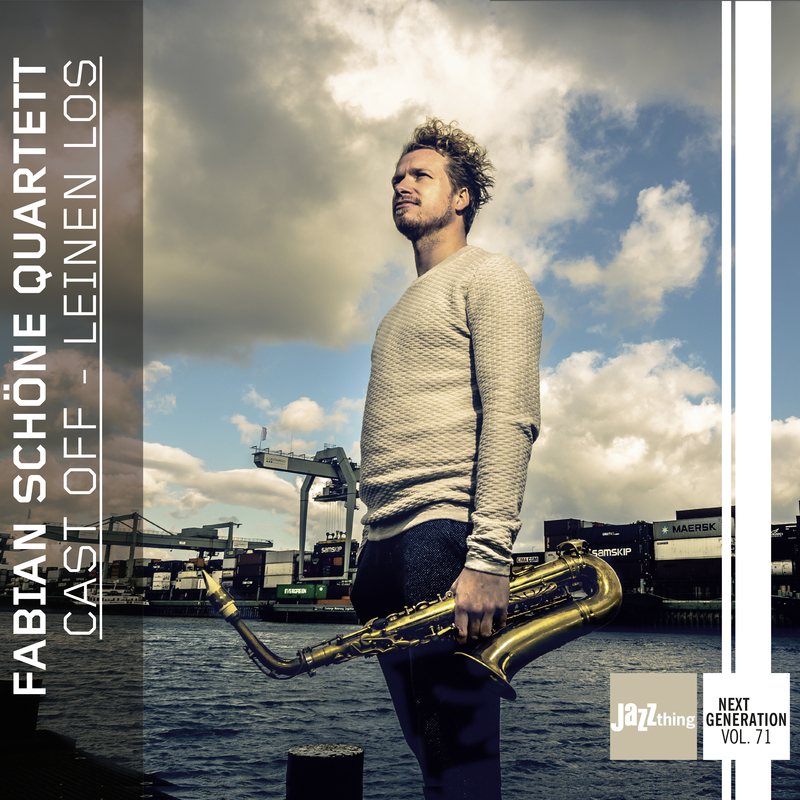 note: the German is simply a translation of the English) for the debut album of the quartet of the alto and soprano saxophonist living in Mannheim Fabian Schöne fits just as well as the mouthpieces on his golden horns. Cast off and go out into the rough sea of a professional musician’s life! While many already disappear into the depths of the vast ocean at first contact with storms, swirls and cliffs never to be seen or heard from again, Captain Schöne’s crew has pieced together an amazingly weatherproof steamer, tenaciously holding his course. As reinforcement, the 71st protagonists of the successful Jazz thing Next Generation series signed up the renowned trumpeter Axel Schlosser. "He is one of the most versatile and creative trumpeters in Germany and also a very pleasant person," Schöne explained the choice of his dialog partner and co-musician. "Axel also has a unique and distinctive sound.” Because the saxophonist and composer also got to know and appreciate the combination of trumpet and saxophone through his work in the band "The Windwalkers", he again decided in favor of this kind of dual leadership in his first musical calling card, and they really harmonize fantastically with each other in “Black Flag”, "Maria” and "If I Should Loose You". The overall picture of "Cast off – Leinen los!" is especially characterized by the always noticeable authenticity, with which all participants get to work. No one has to compromise; all play exactly what they love and also like to hear: fresh, pleasant non-nostalgic post-bop full of swinging and rocking grooves, solo gems, picturesque, hymn-like melodies and sophisticated sets, held together by an organic group sound, for which the Hungarian pianist Laszlo Szitko, the Franconian bassist Friedrich Betz and Ludwigshafen drummer Tobias Frohnhöfer stand. The nine pieces recorded on May 9 and 10, 2017, all composed by Fabian Schöne, were created over a longer period of time and have a distinctive common theme. "Because I am originally from Flensburg, in other words grew up at the coast, and am also passionate about water sports, the titles always deal with the wet element or have a Nordic touch for me.” The influence of great exemplary musicians such as Kenny Garrett shine through not only in the opener "Black Flag". As a member of "Windwalkers", Fabian Schöne won first prize at the 8th International Jazz Competition in Bucharest in 2014. In the same year, he could be heard as the opening act for Wayne Shorter and Herbie Hancock at the Stuttgart Jazzopen. Since March 2015, the 30-year-old has enjoyed the advantages of a scholarship from the German National Academic Foundation. He also plays as a member of the Little Vintage Orcherstra, Itchy Pants, and the big band KicksʼnʼSticks. Not only Axel Schlosser as a guest on the robust next generation ship predicts a promising future for Fabian Schöne and his friends: "It was not only a lot fun to participate in the recording of Fabian's first album, but I am also very pleased to hear the result in its entirety now a few months later. After you have pushed the play button once, you will want to hear more in any case!" In sailor circles, the wish is for "fair winds". Hats off! "The sound of the group is best described as fresh, pleasant post bop without nostalgic features with a lot of speed and swing, beautyful solos and picturesque melodies. All the pieces came from the pen of Fabian Schöne and it must be said, he shows himself a master."